NEW YORK (CNS) — New York Cardinal Timothy M. Dolan joined in mourning what he called the “brutal and irrational execution of two young, promising and devoted police officers” fatally shot Dec. 20 as they sat in their New York Police Department cruiser on a Brooklyn street. “God’s holy word, which we just heard, and the sermon that follows, are supposed to be good news. Some days that’s tough to give, this good news, and this is one of them,” the cardinal said in his homily during Mass Dec. 21 at St. Patrick’s Cathedral. 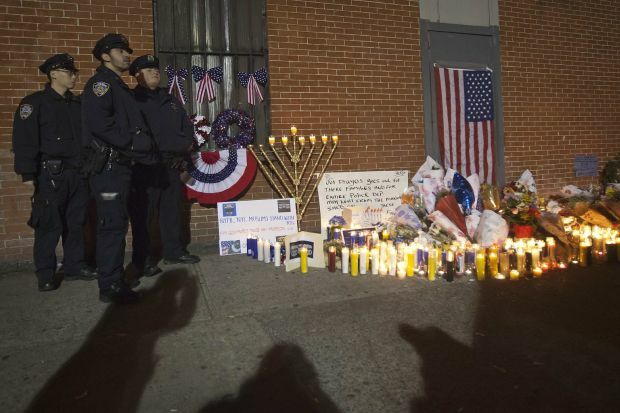 According to police, officers Rafael Ramos and Wenjian Liu were ambushed as they sat in their marked police car in the Bedford-Stuyvesant section of Brooklyn. A gunman opened fire on Ramos and Liu, shooting both fatally in the head. The suspected shooter, identified as Ismaaiyl Brinsley, then fled to the subway where, police say, he committed suicide. An AP story said Ramos and Liu were part of a special detail assigned to help reduce crime in that part of Brooklyn. Ramos, who recently turned 40, was married and the father of two sons, a 13-year-old and a college student. He joined the New York Police Department in 2012, after working for several years as a school resource officer. Liu, 32, had been on the New York police force for seven years and had gotten married just two months before being killed. “Never is the hope of the good news of God’s promise and fulfillment erased for a believer, and the more it is tested the stronger it gets,” Cardinal Dolan said. “Anthropologists tell us that our ancestors millennia ago were gripped with fear and anxiety on this day, wondering if the sun, the light, would reverse its descent and start back up into the sky, if the days would gradually get longer and the light more obvious,” Cardinal Dolan said. “Year after year, they would hold their breath with fear, only to discover that, yes, tomorrow, the sun would be reborn, and start upward,” he said. It is “no surprise that the church would place the birth of the Son … right at the rebirth of the sun … and we have Christmas,” he continued. “At the darkest time of the night, near the darkest day of the year, Jesus the light of the world, was born in Bethlehem,” Cardinal Dolan said. “He will teach us gently and manifest radiantly in his own birth, life, death and resurrection that light trumps darkness, hope beats despair, grace wins over sin, love defeats hate, life conquers death. Cardinal Dolan told the congregation that the day before, when he arrived to celebrate Mass at St. Simon Stock Church in the Bronx around 4:15 p.m., he learned “the chilling news” about the murder of Ramos and Liu from the police officers at the church. He noted that St. Simon is right across from Precinct 46 headquarters, so he asked the officers to take him over there. “I was able to spend time with 30 or so of them, meeting them, embracing them, trying to console them, praying with and for them. As you observed so well yesterday, Mayor (Bill) de Blasio, it was for them, a ‘death in the family,'” the cardinal said. De Blasio and his wife, Chirlane McCray, were sitting in the front pew at St. Patrick’s Cathedral, as were Police Commissioner Bill Bratton and Chief of Police James O’Neill. NEXT: Demographic changes affecting church now an emerging reality for U.S.